I do like this, it is quite a speedy USB Flash Drive, but it is physically large, about 3 and 1/4 inches without the end cap. 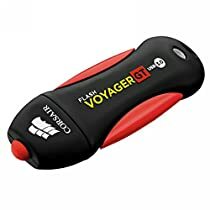 I have a 16GB Corsair Flash Voyager USB 2.0, which is blue where this one is red, and it is much smaller, about 2 and 5/8 inches. I also have a 64GB USB Flash Drive from another manufacturer which is only 1 and 3/4 inches long. One fast drive very happy with it. I have owned many different brands and models of flash drive other then when i first used one this is the only time i have been impressed. I can quickly transfer large thing like movies or tons of small things like music files and bring them with me to friends houses work or just plug in the side of my TV and play them. It is very surprising how much faster this is when used as a USB 3.0 compared to USB 2.0 drives. If you looking for speed this is the fastest one i have used so far. The only complaint is how fat it is sometimes it blocks me from using other ports but at home i have a short USB to USB extension i use so it doesn't bother me. Like the drive and have ordered a second one for my fiance. Functionally it works perfectly, but it's big. Also, the cap is rubber and is held on by friction against the male USB plug... I'm wondering how long that friction will be sufficient to keep the cap on under daily use.